Supporting Africa is a "high priority" for the International Atomic Energy Agency (IAEA), the Vienna-based organisation's director general, Yukiya Amano, said yesterday in his opening address at the Nuclear Africa 2015 conference held in Pelindaba, South Africa. Nuclear power is a unique technology with unique requirements. It involves a long-term commitment and requires significant financial and human resources, Amano said. Issues such as radioactive waste management, and public perceptions, must be carefully considered from the very beginning of a nuclear power program. Africa faces an additional challenge, he said, concerning the relative size of the grid necessary to support the introduction of nuclear power. This year, the IAEA will, for the first time, conduct Integrated Nuclear Infrastructure Review missions to Nigeria, Kenya and Morocco - three countries which are considering introducing nuclear power. These are review missions by international experts who help countries assess the status of their national nuclear infrastructure. They are part of the comprehensive package of assistance which the IAEA provides to help ensure that even the most challenging issues in introducing nuclear power can be successfully dealt with, Amano said. Two important challenges involve costs and waste management. "The high cost of building a nuclear power plant is seen by some as an obstacle to future development. Nuclear power plants are indeed expensive to build, but once they are up and running, they are relatively inexpensive to operate throughout a life cycle of 30 or 40 years - or even more," he said. Waste disposal is often cited as one of the major problems facing nuclear power, but in fact the nuclear industry has been managing waste disposal for more than half a century, he said. Dozens of facilities for low-level and intermediate-level nuclear waste are in operation throughout the world. As far as the management of high-level radioactive waste and used fuel is concerned, he said, good progress has been made in recent years, especially in Finland, Sweden and France. "The IAEA, with 163 Member States, brings together countries with advanced nuclear power programs and what we call 'newcomers'. This sharing of knowledge and experience means newcomers are not condemned to repeat the mistakes of pioneers," he said. "They can benefit sooner from the shorter construction times, more profitable performance, and higher safety levels of today's best plants. There may be potential for smaller countries to cooperate regionally on nuclear power projects which might be too expensive for any one of them on its own." The lasting legacy of the Fukushima Daiichi accident in Japan will be a significant and lasting improvement in safety at nuclear power plants all over the world, he said. "The changes are already apparent. I have seen major improvements in safety features in every nuclear power plant that I have visited since the accident. This gives me confidence that nuclear power will remain an important part of the energy mix of many countries for decades. I have no doubt that a number of African nations will be among them." Later, at a special event marking the 50th anniversary of South Africa's first research reactor, Amano said the country provides an excellent example of how modern technology can be used effectively to advance development and improve people's lives. "South Africa is also a role model in terms of South-South cooperation, generously sharing its expertise in the nuclear field with countries on the African continent and beyond," he said. 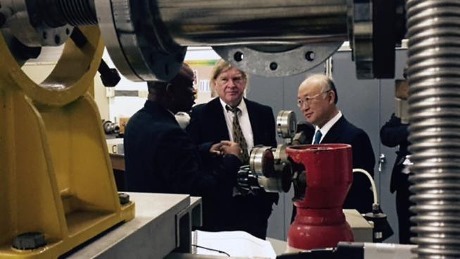 In his address to a select audience that included President Jacob Zuma, Amano noted that the SAFARI-1 research reactor is the leading producer of medical isotopes in Africa. It is also one of the four largest producers in the world of one key isotope - molybdenum-99 - which is used in over 70% of nuclear medicine procedures globally. Amano highlighted the cooperation between the World Health Organization, the IAEA and national governments on increasing access to oncology and radiotherapy services in developing countries. "I am very grateful for the active role which South Africa plays in sharing its cancer expertise with other countries, especially in providing specialist training and fellowships," he said. Referring to the top global health concern of 2014, the Ebola outbreak in West Africa, Amano outlined the IAEA's rapid response measures, which included providing equipment, laboratory supplies and technical advice. This contributed to quick diagnosis of the disease in affected countries, he said. Follow-up work will help African countries to better track and detect animal diseases that can eventually be transmitted to humans, such as Ebola, he said, adding that South Africa's National Institute of Communicable Diseases has been an indispensable partner in this work. Treating animal diseases - such as foot-and-mouth disease and rinderpest, fighting pests and increasing agricultural productivity have also been important pillars of the IAEA's work in Africa, Amano said. Emphasizing that access to electricity is critical to development, Amano spoke of the role nuclear power can play in developing countries. "Many countries see nuclear power as a stable and clean source of energy that can help to mitigate the impact of climate change," he said. South Africa plans to expand its nuclear power program in the coming years, while also investing in other areas such as renewables. Amano also held discussions with energy minister Tina Joemat-Pettersson and visited the Ithemba Laboratory for Accelerator-Based Sciences at Wits University.